A medium to large tree, Magnolia grandiflora ‘Exmouth’ has a more upright habit rather than spreading so is useful as a screening tree. From the Southern sates of North America in ideal conditions over time it can reach 20m + however in cultivation usually growing to around 10m in height. 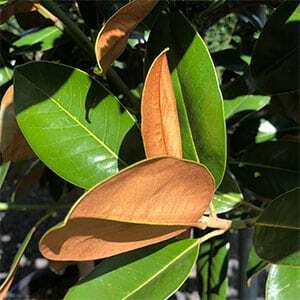 Be aware that two forms of this excellent tree are available the second is Magnolia Grandiflora ‘Exmouth’ (Compact Form) and is usually what is sold, but not always labeled as such. It is a bushier habit with broader foliage than ‘Exmouth’ itself, with a wonderful bright cinnamon felt or indumentum on the underside of the leaves. Be a little patient if you are buying a small specimen as they can take 7 – 10 years to flowers. Plant in a deep moist but well drained soil, full sun to part shade, the warmer the climate the more shade. Mulch to retain moisture and maintain a cool root run. Water in well when planting using a liquid seaweed fertiliser. Stake to ensure a good upright habit. Once it settles in Magnolia Exmouth requires little care and only watering in very dry periods. Replenish mulch each spring while the soil is still damp. Like all Magnolias, Exmouth is a little shallow rooted so it does not like to be disturbed by digging, we suggest mulching to keep weed free and planting some hardy small bulbs beneath, crocus, daffodils and the like. Position – Full Sun, although part shade in hotter climates is also suited. Soil – Humus rich well drained with some summer moisture. Height – From 10 to 15 metres. Spread – Will form a crown to 8 metres across. Foliage – Deep glossy green with brown indumentum on the reverse..